Google has released its fifth penguin, which is a spam fighting algorithm. 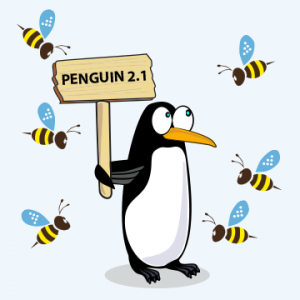 Since the time this penguin has been launched Google is using enhanced version of penguin 2 and it started calling it penguin 2.1. You don’t need to worry as I am going to explain this numbering aspect. Matt cutts, who is the head of the web spam team of Google, revealed that this release will be impacting around 1 percent of searches. Why Penguin 5 Or 2.1? If you call something penguin 5 and Google again renames it as penguin 2.1 it would be surely hurting your head and it is hurting my head too. Google released panda algorithm to eliminate low quality content. When it released the second one people called it panda 2 and as it released the third panda people called it panda 3. But, according to Google it was only a minor change in the third version of panda 3 so, it is better called panda 2.1. This indicates that it was only a minor change. And if there are any further minor updates taking place then it would be naming it in decimals. Want To Know What Penguin Really Means? Penguin is nothing, but a part of Google’s search algorithm that finds out the sites that are spamming the search results. It has been more than a year since Google has launched penguin. This algorithm fights spam effectively and is improving things as it was intended. But, some of them who have been hurt by this algorithm are looking for ways to recover. Many people felt that penguin was unfair to hit them even when they were not involved in any spam. On hearing this Cutts said “We would like to investigate about these cases, but these changes have not affected Florida”. Google is confident that penguin would be catching the persons who are engaged in spamming. Why Spamming Is Still Getting Through? The most difficult tasks about this update are showing people the ways to recover if they are hit by penguin. The main reason for these websites being hit by penguin is bad linking usage and practices. Last year if you have been spammed by Google you might be told to file for reconsideration. However, Google said reconsiderations will not be helping the persons who have been hit by penguin. Google said “The best way to recover is to clean up the spam”. Google has launched its new search algorithm, which has the ability to catch people who are involved in spamming search results. Google also said that this update will be impacting around 3% of queries. So, pages that attain better rankings through keyword stuffing duplicate content and link schemes will be termed as spammed pages. This update has been thematic, in fact every update that is done to Google’s search algorithm is done keeping one thing in mind that is to provide relevant results and find information.